Hey There Hunt Families - I don't know about you, but there is a definite slow down at my house with the end of Fall sports. If your child suddenly has a lot of time on his/her hands, a new session of afterschool programs starts on November 3rd. Letters went home at the end of last week and activities are first come, first served, so get those forms in ASAP! Our Hunt kids are so lucky. We have Kathy Olwell putting together so many diverse afterschool options for our kids. Middle School is a great time to try out a variety of different programs and explore interests not connected to academic classes. Maybe your child will discover a new talent or passion. Because the programs are free and for a limited time, there is nothing to lose! Pay it forward at Hunt Our annual appeal letter goes home with students this week. In case papers don't make it home in your child's backpack (a mystery akin to socks disappearing in the dryer...) the letter is also included at the end of this post. Your donations mean less fundraising and all Hunt students benefit from your generosity. PTO Meeting Minutes from the October meeting can be found at the end of this post. Dance this Friday from 7-9pm. This dance is sponsored by the Student Council and parent chaperones are still needed! You can sign up for 7-8, 8-9, or 7-9. Please call the office and leave your name, your child's name phone number with Ms. Virun and you will be contacted. Office # is 864-8469. Thank you so much! Harvest Dinner countdown This free event should definitely be on your calendar. (10/30) Hunt students and faculty have been working hard harvesting root veggies, menu planning, practicing songs to entertain you and completing projects focusing on food to be highlighted at this dinner. Bring your family and friends and help us celebrate the Harvest - in past years, estimated attendance has been over 800! Would you like to volunteer some time helping make this event a success? Looking for help serving, supervising vegetable chopping, clean-up in the kitchen and serving dessert - volunteers only work part of the time, so there is plenty of time to eat and visit with Hunt families. To volunteer, call or Email Michelle Virun in the front office mvirun@bsdvt.org or 864-8469. • Team activities: Team grants for field trips, bus fees, etc. • School Improvements - Examples of completed school improvements 2013/14 include- Video equipment,landscaping & front-entrance renovations, stone circle. That is all it would take!! If .50cents/week/student is paid for the 40 weeks of school, we could accomplish all of the above. We need $8000 to make this happen. There are 400 students at Hunt. That equals $20/student for the year or .50cents/week. $20/year - That’s just one less time a year eating out, or 1 less pack of gum a week, or a few less coffees a month. You can send in the $20 all at once or pay a few dollars each month, or any amount that works for you. Whatever method works best for you, is greatly appreciated and utilized by our students and staff!! The PTO raises $8,000 annually to support activities outside the school’s budget, as listed above. Our goal is to supplement and strengthen the curriculum offered by the school’s faculty, staff and administration to the benefit of all of our students. If you are interested in becoming part of the fundraising team at Hunt, we welcome your participation and support. Please contact Tammy Kuypers at Kuypers5@yahoo.com. We can’t do it without you! Each dollar you give will go directly to supporting the students at Hunt Middle School. 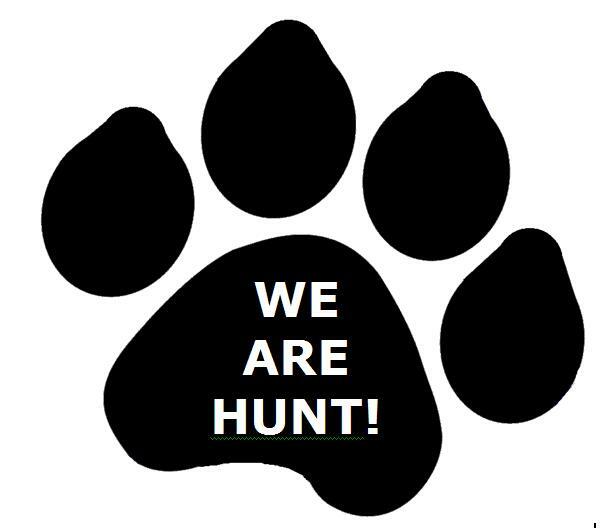 The Hunt Middle School PTO is a recognized 501c (3) charitable organization. Your donation is tax deductible. A receipt is available upon request. In addition, many companies will provide a dollar-to-dollar match. Check with your human resources department for their policy. Every dollar counts. Homework: Parental concerns on homework consistencies were expressed. Some teams seem to either have a ton of homework or absolutely nothing. Me. Phelan also agrees that we need to establish more consistency with teams and maybe even more consistency between the middle schools(Edmunds). The solution, Mr. Phelan had brought up was that all teachers are a part of a content team and the matter would be discussed there. They are currently working at getting the sixth grade team involved too. Mr. Phelan also emphasized that because we are a school in restriction and along with the common core standards, this should also automatically assist in correcting the homework issue. He also expressed the importance that homework help is available for those children who require assistance in getting it done and that teachers have been promoting it within the classroom. A parent did share however, that the solstice team seems to be doing a great job with balance in homework. And another parent suggested that there should be a overall school standard to have the teachers sign the planners to ensure that the pertinent information in the planner going home. Mr. Phelan said that he would follow up on that possibility as well. We are currently looking for fundraising team members and a president. A separate email will be sent out to express the void in these areas. Unfinished business from last year was discussed. Discussion is still being made with teams that they have the extra money from last year to be figured in by this November. An email will be sent out in regards to this. Clarification of the entrance projects project was that $2011.73 will most likely be spread out over a few years. Follow up for the Healthy City Garden grants is needed. After having extra money left over from last year (in April 2014) we gave them the money but they never received it. We called and left messages. The school budget covered new uniforms for both basketball ($600)and baseball ($473). Concern was made that the girls soccer field area contains a lot of glass and is in awful condition overall. It is recommended that irrigation, new seed and topsoil be placed. We can visit this option later depending on funds available. Assembly funds: in the past, Speaker John Halligan seemed to be a favorite. He was a little bit a little bit more expensive than our past assemblies however, parents did express their opinion that he was worth it. If fundraising efforts are successful this year (depending on if we have a fundraising team or not) we may want to consider getting him back again. http://www.ryanpatrickhalligan.org/assemblies/presentations.htm However, at the same time, it was agreed that we do cut back, overall, on at the assemblies for now from $2000.00 to $1200.00. Harvest Dinner: It was suggested that we rethink the avenue we take with the harvest dinner next year, as far as PTO involvement. For this year however it was brought up that it would be a good idea to raffle off a basket with donated goods. A parent will be going to Roxy to ask for donations for tickets to include in the basket. PTO Appeal: A letter will be going home to parents asking for a donation of $20. This is in lieu of fundraising due to no fundraising team to coordinate events. It was suggested at the harvest dinner that announcement be made just to give a heads up to parents about the letter of appeal going home, providing the status of the PTO. An idea was also brought up to put up pictures on a TV screen to promote the status and what the future support of the PTO could provide, based on past projects. These pictures would show what the PTO has supported in the past. Mr. Phelan will send out teachers a email looking for pictures of things that the PTO has supported in the past such as field trips and equipment, etc. A parent also agreed to follow up with the video club to see if they would want to support this project of the video being played at the harvest dinner. It was brought up that if we do not do something to cover expenses for protection of the new digital sign, erosion will occur over time. Repairing the sign from the erosion would be quite costly, so preventative measures should be taken sooner than later. This will be followed up on to see if the trade program within the high school would be interested in completing a project like this, to build some sort of protective barricade around the sign. Iron Chef. We believe this to be a very valuable involvement for our children. However, since being on the topic of cuts (again, due to lack if fundraising PTO involvement), we need clarification on what the $400 covers. A parent volunteer will follow up the director of the after school program for additional details and to see if additional assistance to head up the program can be obtained through them. Mr. Phelan discussed that we have to finish the auditorium yet, as a part of scheduled maintenance. On Saturday, October 4 at around 6 PM a leak was discovered in the middle section of the gym during a routine building check. Head of property services called Servpro to come, cleansed pump air into the floor boards and under the bleachers. Locker rooms are currently out of commission. There is a priority to get at least the locker rooms back in. The district electrician is to come in and change out all the outlets completely. Air-quality testing will be done to assure that there is no mold. Conferences: A parent expressed a concern that in the future, that parent teacher conferences should not be encouraged JUST to parents of high risk students. But to promote that they are available to anyone and everyone regardless of those scheduled time slots. Mr. Phelan stressed that individual conferences can be made at any time regardless of the specific allotted time spots. He stressed that the time provided for teacher attention to students is more important not just during the conferences. It was noted that this practice, in getting all parents and students involved in conferences, has changed in a positive way, from how it use to be. Lunch Time: Parents expressed concern to Mr Phelan about the 1st lunch time slot of 10:45am. That by the time these children eat again, there would be several hours that have past. Mr Phalen addressed that because of the growing school (and district overall) there are plans to work on resolving this issue of having so many split lunches, as the current cafeteria can only hold so many. This would be done (eventually) with modifications to the current school and/or the possibility of an additional school all together. Although, while this is a long term possibility, Mr Phelan stated that to resolve the current situation at hand, an idea would be to offer an additional food option into the day, outside what is already offered after school, with the after school programs. Harvest Dinner:Mr. Phelan said that the parent volunteer Coordinator for the harvest dinner will be sending out emails to all parent volunteers to very soon. It was also brought up that the kids keep touching the gardens and we need to perhaps come up with some ideas on how to keep them out. Children need to be more respectful of these areas and the overall school grounds. Perhaps with the garden areas, to create signs to remind them to keep out. It was also agreed upon that there needs to be some sort of accountability plan established to help with liter. By doing so, have classes on a scheduled rotation to go out and pick up litter from the grounds? Mr Phelan said that he plans on adding the issue of litter to his announcements to the students. Especially making note of the bus stop. Access to water is needed on the Auditorium side of the school in order to water plants. Mr. Phelan said that he would look into plumbing options for this within the school district. Clean up and bringing planters was discussed. The three trees around the digital sign will be removed and replanted (somewhere along North Ave) for free. Since we have no PTO President , a parent thankfully stepped up to the plate to facilitate the next meeting in November. Kate Belluche (former PTO President), said she would put together an agenda for November.